« Last minute opportunity for a two day course! Hi there again. 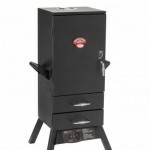 You asked me to let you know about the Landmann gas smoker. I couldn’t get on with the Tennesee and charcoal but this gas one is great, So easy to use and control the temperature to a constant 100 degrees. The only gripe I have is the temperature gauge is not accurate and you have to fiddle with the ignite mechanism to get it to work for the first time. I use a temperature probe. You do need really thick BBQ gloves to pick up the smoker box to refill with the wood chunks as it gets very hot. I use chunks of fruit wood that I get for free, but you can also use the commercial wood chips. The proQ cold smoker (Cold Smoke Generator – or Gizmo as those who have been to Smoky Jo’s will know it as! – Ed.) will fit where the hot smoker box usually sits, so you can use it for hot or cold smoking, so it is a good all-round multi purpose smoker. Hope this is useful. I sooo love your book, and re read it often to try out new smoked foods. It is my smoking bible. I hope you don’t mind a new smoker suggesting a couple of ideas. You have probably done it already but have you tried smoking dark chocolate? I smoked some overnight and used it to make some chocolate truffles with some smoked raisins which I had soaked in Jack Daniels. The smokiness made the chocolate even more chocolaty. And I made some into ice cream too. I smoked some tinned chickpeas which I made into houmous with garlic, lemon and yoghurt for a lighter option and I am hooked on it. I word of caution on the ProQ smoke generator. Having read your excellent book I bought a ProQ. It worked fine for the first 7 hours , until the ProQ dust burned out and I refilled with my own . Then the fun started . I should mention I have a “free” supply of beech chips from a chum who smokes fish for restaurants etc . The chips are about 1 to 2 mm. My chips simply would not keep smoking . I dried them in the microwave and the boiler room , I ground them smaller , I ground them to dust . But they simply will not produce a good even burn with the ProQ generator. So by all means say positive things about the ProQ BUT please add the caveat that for consistent results you have to use ProQ dust and ProQ dust is expensive at £5 a smoke. Whenever going to the trouble and expense of smoking food we always recommend having your smoker FULL! NB We are NOT on commission for these smokers but we have a good working relationship with Macs (ProQ) – they are lovely people to deal with and we have been using their smokers for many years!